A comprehensive set of functionality is available with the COMSOL Multiphysics® software to compute heat transfer in thin layers. A technical description of how this provides accurate results with minor computational effort could be the purpose of a full blog post and is not detailed here. Instead, we focus on the questions related to the Layered Material technology, available as of version 5.4: What does it do? How can you update existing models? How does your simulation benefit from it? 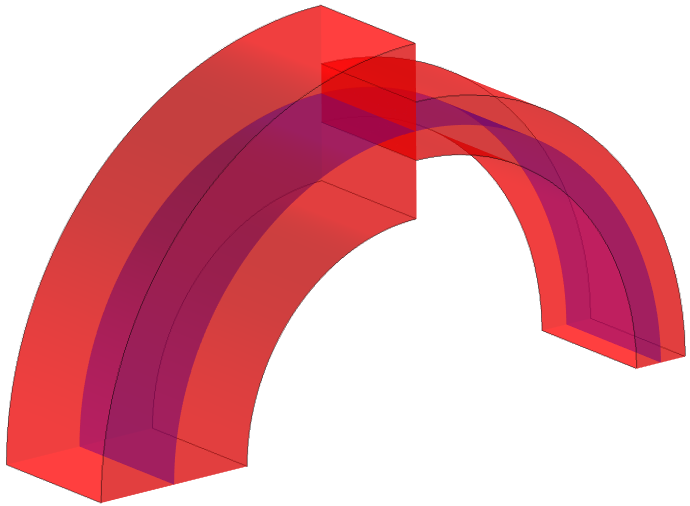 COMSOL Multiphysics includes functionality that accounts for specific thermal properties in thin layers of a geometry and solves for heat transfer through layers without representing them explicitly in the geometry. Electric currents and mechanical stress can be defined in the layers for various fields of applications, such as electronic components and laminated composite shells exposed to thermal stress. The image below shows the temperature distribution in a steel column subjected to a temperature gradient. A thin ceramic part made of two different layers, located at half-height of the column, acts as a thermal barrier due to its low thermal conductivity producing a jump in temperature across the ceramic part. The ceramic layer is represented as a surface in the geometry rather than two thin volumes to alleviate the constraint on the mesh size that would come with the high aspect ratio between the different parts of the geometry. This high aspect ratio would make the visualization in this part very difficult. Although the ceramic part is not represented explicitly in the geometry, you can solve the temperature distribution through the layer and magnify it for better postprocessing, as shown in the figure below. 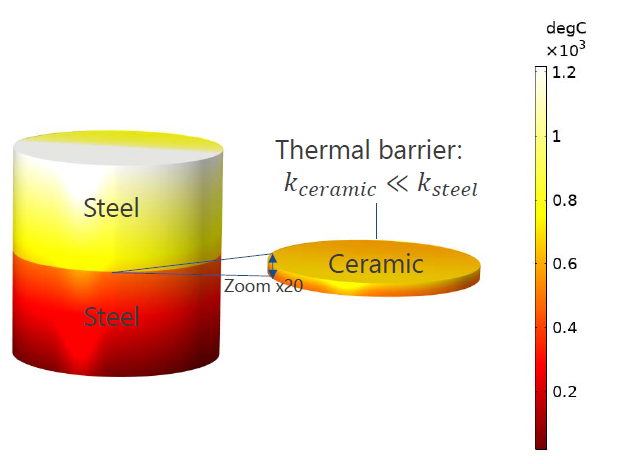 Temperature distribution in a steel column with a ceramic layer, computed with the Heat Transfer in Solids interface and the Thin Layer node. The thickness of the ceramic layer is enlarged 20 times for visualization. See the Composite Thermal Barrier tutorial in the Application Gallery for more details about this model. 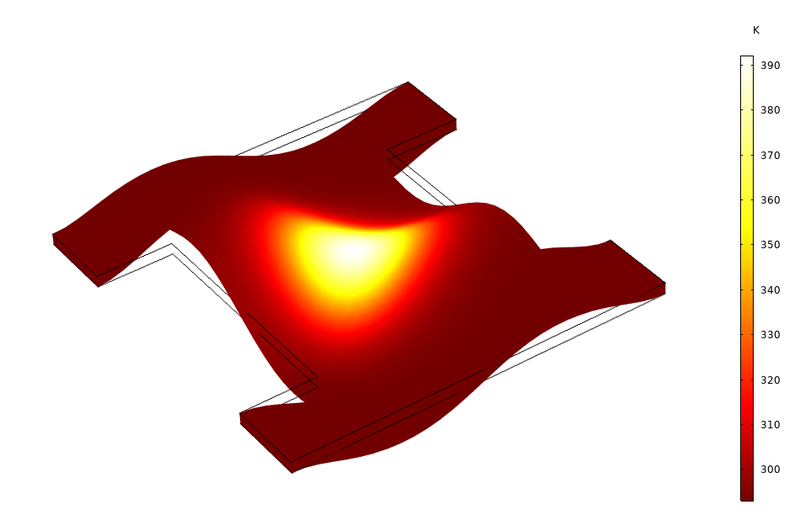 What Does Layered Material Technology Bring to Heat Transfer Modeling? Geometry containing the layered shells and material composition of the layered shells applied on boundaries 1 and 2. The layered shells are included in the geometry as surfaces, but the physics equations can be solved on the reconstructed volume (shown in red in the figure below) with degrees of freedom (DOFs) added in the reconstructed volume. Reconstructed volume representation of the layered shells applied on boundaries 1 and 2 (10x scaling on the thickness). When modeling heat transfer in this geometry, we want to specify the number of layers as well as the thickness and material of each layer. On top of these properties, it may be handy to have access to advanced parameters, such as the number of through-thickness mesh elements, orientation and position of the layered material on the boundary, and specific material properties at the interfaces of the layers. Since version 5.4, all properties of layered shells, except the material, are defined by a Layered Material node. It includes the composition of the layered shell, along with the geometry and discretization properties of each layer. The physics node (Thin Layer for this example) simply points to the Layered Material node (top part of the figure below). Then, the Layered Material node points to material nodes for the definition of the material properties (bottom part of the figure below). Model nodes involved in the definition of a layered shell. Screenshot of the model tree and the Solid node Settings window. Read the blog post on analyzing wind turbine blades to see how these nodes can be combined to model a wind turbine composite blade. How do we make use of this functionality for heat transfer? 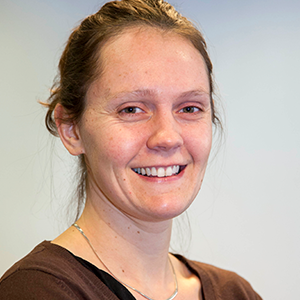 How does it benefit the simulation process? 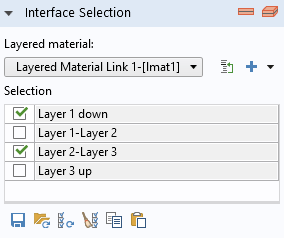 Now, let’s clarify some of the settings that are available with the Layered Material technology. For this, we consider the Heat Transfer in Shells interface, which is applied on the example geometry mentioned in the previous section. Because the layered shell properties are defined in the layered material nodes, the boundaries available as a selection of the Heat Transfer in Shells node define the layered material. When no layered material is defined yet (see the following figure) — which is your configuration when you start to build the model — the most natural setting process is to add one or several layered materials from the Heat Transfer in Shells node. This creates nodes under Materials and automatically links the physics interface to these nodes. 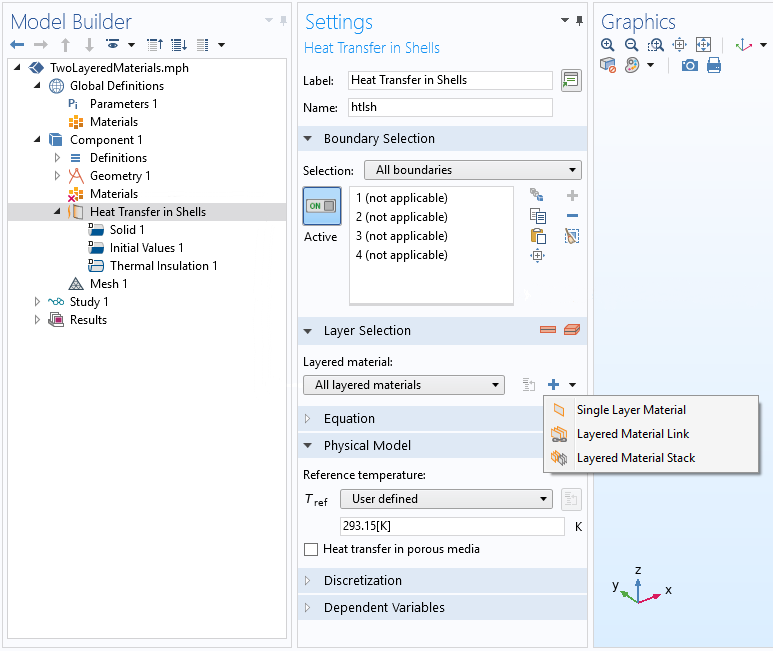 Screenshot showing the creation of a layered material node using the Plus button from the Heat Transfer in Shells interface Settings window. 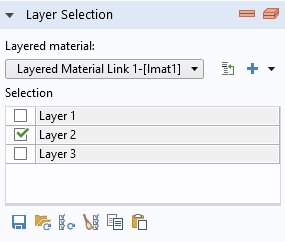 Next, add one or several materials from each layered material node. This creates nodes under Materials and automatically links the layered material. 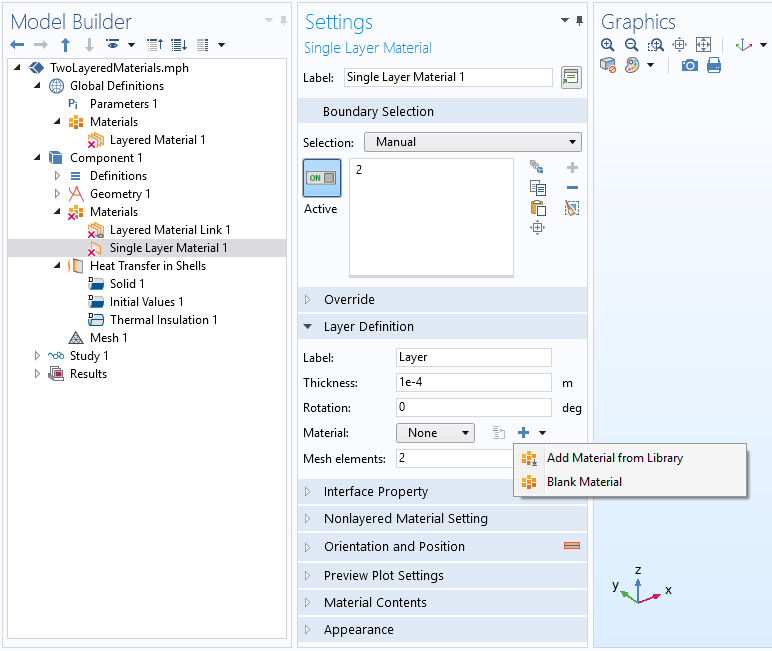 Screenshot showing the creation of a Material node using the Plus button from the Single Layer Material node Settings window. Depending on the type of layered material, different settings are available; see the Composite Material Module User Manual for details. Once you’ve updated your model, flexibility is enhanced for several aspects of your simulation process. First, you can set any number of layers with different material and geometry properties. In addition, you can apply heat sources and fluxes on specific subsets of layers or at interfaces between layers (including the external interfaces), as illustrated below with the Heat Source and Heat Source, Interface nodes. 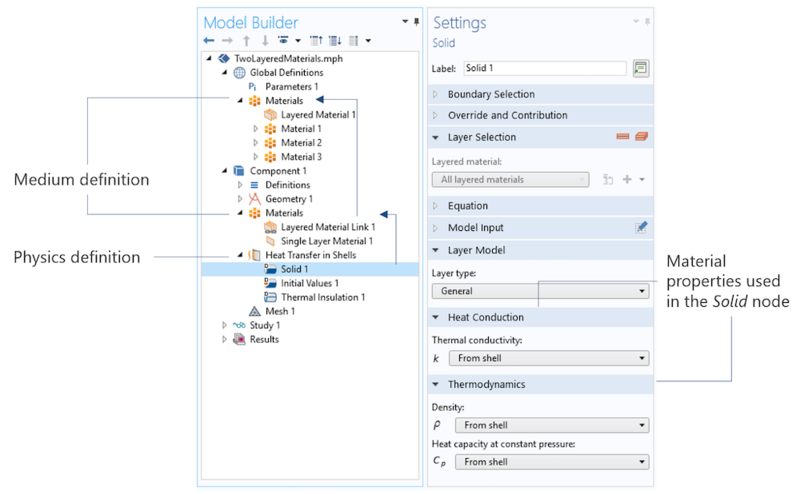 Screenshots of the Settings windows for the Heat Source (top left) and Heat Source, Interface nodes (top right) as well as the corresponding Layer Cross Section Preview images generated when clicking the buttons at the upper-right of the screenshots. When considering thermal expansion, you can apply a rotation on each individual layer for the anisotropic modeling of heat transfer and solid mechanics. 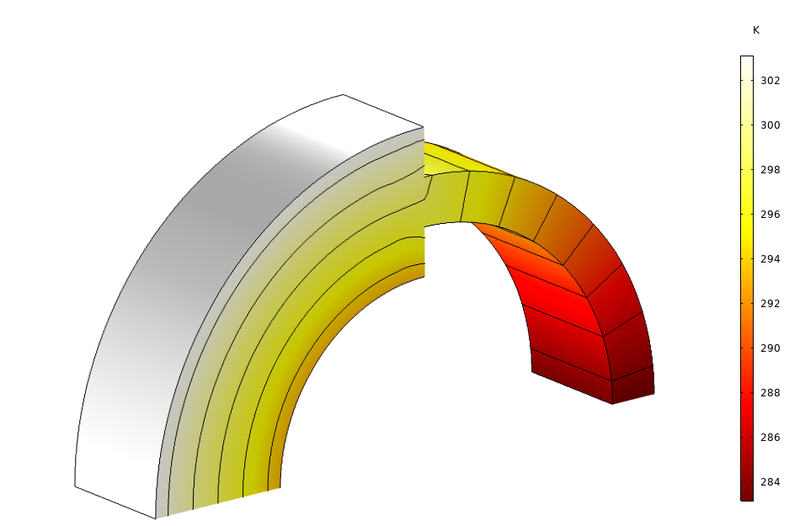 Another benefit is that specific through-thickness meshes can be used on layers, and you have the choice to set the temperature field as continuous or discontinuous at the common edge between adjacent layered shells (middle of the bow in the figure below); by default, it is discontinuous. Temperature field, discontinuous at the edge where the layered materials coincide (x10 scaling on the thickness). By using the Continuity node, the temperature continuity can be enforced if needed, as shown below. Left image: Layer Cross Section Preview of the Continuity node, applied between the layered materials of boundaries 1 and 2 (automatic scaling on the thickness). Right image: The temperature field, continuous at the edge where the layered materials coincide (10x scaling on the thickness). Several sketches to preview the layered material configuration are available for preprocessing, and specific plots allow you to visualize the computed fields through the thickness of the layered material, on slices of it; or on a full 3D representation (with scaling on thickness), as demonstrated above. More details about the Slice and Through thickness plots available with the Layered Material dataset can be found in this blog post on the Composite Materials Module. Finally, for a greater numerical verification of the simulation results in a layered material, you can also evaluate layerwise averages and integrals by using specific operators. See the Composite Thermal Barrier tutorial to get a demonstration of how the xdintopall operator can be set to integrate the temperature in the thermal barrier (in all layers), and how the atonly operator allows you to specify the evaluation context, for example, of a specific layer in the layered material. By combining these two operators, you can make sure the average temperature obtained in each layer with the thin layer approach is very close to those obtained when the thermal barrier is explicitly represented as a volume in the geometry. Before concluding, we should mention the approximations available for heat transfer in layered shells (in the Thin Layer node, for example) when the layers are considered either very good or very bad thermal conductors. By choosing the Thermally thin approximation option, you assume thermal equilibrium between both sides of the layered shell. This applies well when the thermal conductivity of the layer is much higher than the conductivity of the surrounding material. The temperature gradient through the thickness of the layer can be neglected in comparison to the temperature gradients observable along the layer and in the surrounding geometry. 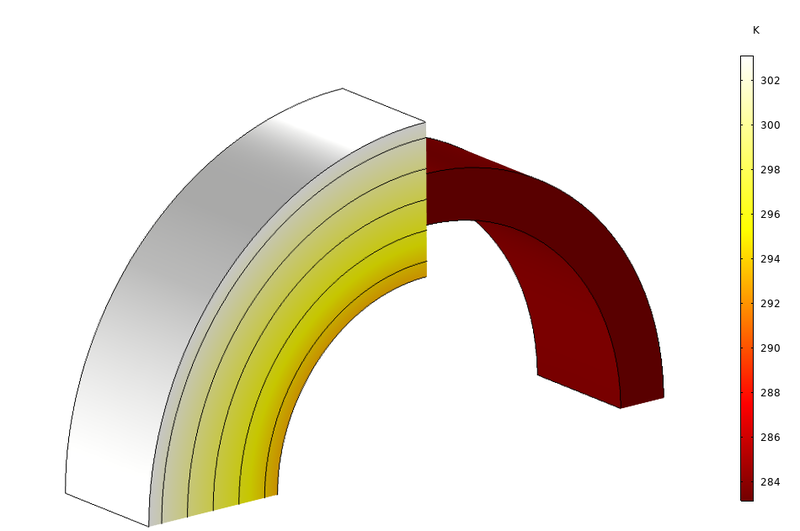 With this option, only the shell contribution to the tangential heat transfer is solved, and the DOFs through the thickness of the layer are not included in the computation. With the Thermally thick approximation option, it is the opposite configuration: Because the layer is more thermally resistive than the surrounding material, the contribution of the shell to the gradient of temperature along the layered shell can be neglected. The heat flux across the layer is obtained by applying the thermal resistance to the temperature difference between both sides of the layer. These approximations — associated to a Single Layer Material node when modeling one layer or applied to the layered shell when using other types of layered materials — help to improve the efficiency of the computation. In this blog post, we have taken an in-depth look at the design of the thin layer functionality for heat transfer, based on the Layered Material technology. You can access an extended set of functionality, with improved preprocessing and postprocessing tools as well as flexibility in the simulation process for configurations of complex layers. Other physics interfaces are designed to use the Layered Material technology as well. Multiphysics coupling nodes are available to model multiphysics processes such as thermal expansion, electromagnetic heating, and the thermoelectric effect in layered materials. For example, see the Thermal Expansion of a Laminated Composite Shell model in the Application Gallery. Temperature distribution and deformation (scaled 200x) of a composite laminate made of 6 layers with various fiber orientations and subjected to narrow beam heating.